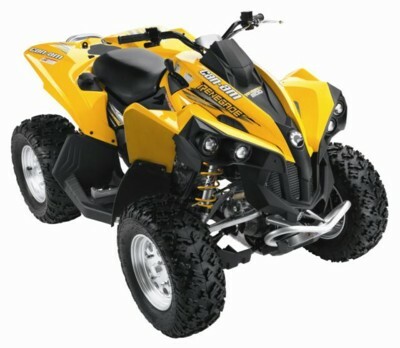 2009 Can-Am™ DS 450™ ATVs, including the all-new DS 450 X mx™ and Ds 450 X xc™. Both X models are designed to be raced straight from the dealer's showroom floor. The base 2009 DS 450 MSRP is US$7,599 (CAN$8,999), with the DS 450 X mx at US$8,999 (CAN$10,799) and the DS 450 X xc US$8,799 (CAN$10,399). As more ATV drivers have discovered the recreational possibilities of their quad – trail riding and touring with recreation-utility vehicles; desert and riding courses for sport vehicles – a growing number of drivers have had to make big compromises. The uncompromising adrenaline seeker that likes to get off the beaten path. 2005--Bombardier Recreational Products Inc. (BRP) releases the Outlander(TM) 650 H.O. EFI, a new Bombardier(i) ATV aimed at one of the industry's fastest growing segments, the 600-700 recreational-utility "rec-ute" class.